With the Owners' lockout reaching its 80th day, the NHLPA and NHL resumed meetings in New York on Tuesday and, after an approximately eight hour session, plan to continue discussions on Wednesday. With 18 Players and 6 Owners comprising the bulk of the group in the talks, the sides were in brief contact on Wednesday morning, before breaking to allow the Owners to attend the Board of Governors meetings, previously scheduled for today in New York. The meetings on Tuesday were the first group sessions following two days of negotiations last week with the Federal Mediation and Conciliation Service. "I thought it was a constructive day, we had a good dialogue," said Steve Fehr, NHLPA Special Counsel about Tuesday’s meetings. "In some ways I'd say it might be the best day we've had, which isn't to paint too overly optimistic of a picture. There is still a lot of work to do and a lot to get done, but we'll be back at it [Wednesday] morning." "I appreciate the efforts of the players, in particular we had 18 players in there [Tuesday] and six of our owners," said NHL Deputy Commissioner, Bill Daly following the meetings. "I think everybody is working hard. I think everybody wants to get a deal done, so I think that's encouraging. We look forward to hopefully making more progress [Wednesday]." 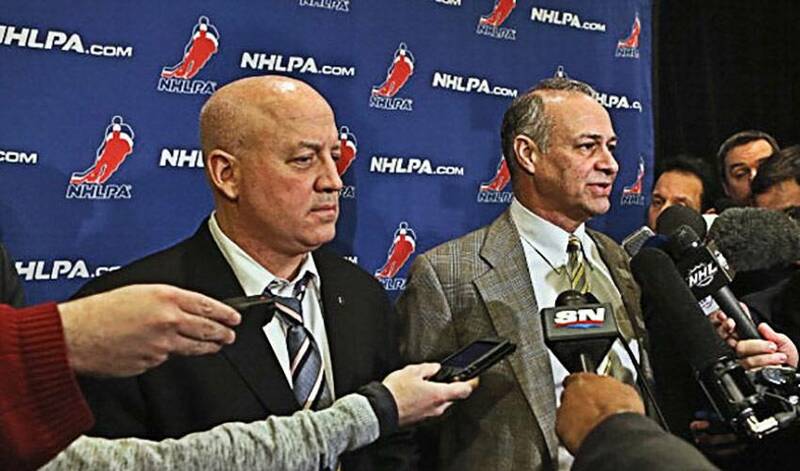 When the meetings between the sides wrapped-up late Tuesday night, NHLPA Special Counsel Steve Fehr and NHL Deputy Commissioner Bill Daly met with the assembled media together, making their comments brief and not fielding any questions. The meetings between the same two groups of Players and Owners are expected to pick-up again early Wednesday afternoon at the Westin New York Hotel at Times Square, following the conclusion of the NHL Board of Governors meetings. The Players will once again be represented by a large group, one that includes: Craig Adams, David Backes, Michael Cammalleri, Chris Campoli, Sidney Crosby, B.J. Crombeen , Mathieu Darche, Shane Doan, Ron Hainsey, Shawn Horcoff, Jamal Mayers, Manny Malhotra, Andy McDonald, Ryan Miller, George Parros, Brad Richards, Martin St. Louis, Jonathan Toews, Kevin Westgarth and Dan Winnik. The Owners group is made up of Ron Burkle (Pittsburgh Penguins), Mark Chipman (Winnipeg Jets), Murray Edwards (Calgary Flames), Jeremy Jacobs (Boston Bruins) Larry Tanenbaum (Toronto Maple Leafs) and Jeff Vinik (Tampa Bay Lightning).